The Association of Teachers of Home Economics (ATHE) are delighted to announce a new partnership with award-winning celebrity Chef Neven Maguire which is supported by the Home Economics Department, St Angela’s College, Sligo. This partnership has been launched to mark World Home Economics Day 2018.The theme of World Home Economics Day 2018 is Home Economics Literacy: Skills for Healthy and Sustainable Cooking. As a collective group of Home Economists, the ATHE calls upon the Irish Government to make Home Economics compulsory for all post-primary students in Ireland. Teaching Home Economics is of critical importance to develop essential food and culinary skills in young people. Home Economics is the only school subject which teaches young people food literacy and cooking skills. ‘’My first cooking lessons were at home with my mother Vera in our family kitchen. I was the first boy in my school to enrol for Home Economics classes in secondary school. These classes were the basis of my love of food which led to my entering Fermanagh catering college and the beginnings of my work at MacNean House and Restaurant. I am forever grateful for the practical life skills that I learned through this subject. I am delighted to support this initiative with the Association of Teachers of Home Economics who do stellar work with young people in schools across Ireland. The campaign will further encourage young people to learn and develop important and practical skills to cook their own tasty and nutritious meals at home. The skills learned throughout Home Economics are ones which students can utilise themselves day to day, and I believe there are massive benefits to having the subject become a compulsory part of the curriculum, regardless of whether they want to pursue a career in the food and hospitality sector." Speaking at the launch of the partnership, President of the ATHE, Maria Hickey, noted “As Ireland struggles through an obesity epidemic, it is vital that all citizens of Ireland have both the food and culinary skills to provide nutritionally balanced meals for themselves and their families. Having studied Home Economics in school, Neven continues to share his passionate belief in the benefits of the subject for all students’’. 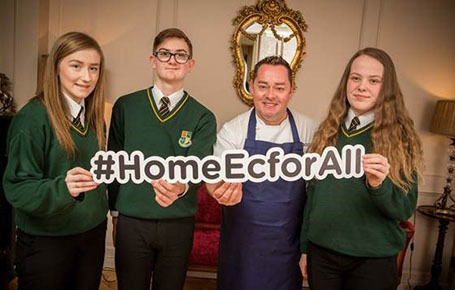 Amanda McCloat, Head of Home Economics, St Angela’s College and a member of the ATHE Executive, welcomed the new initiative and spoke at the launch “this partnership with award winning chef Neven Maguire is testament to the positive influence Home Economics has on so many young people in schools. The subject teaches essential lifeskills in the areas of food, cooking, health, resourcefulness, sustainability, family and textile skills which students can use throughout their lives in order to be independent and achieve optimal, healthy and sustainable living”.